May we just agree to be amazed just how much broccoli and tomatoes really do look like an evergreen wreath with red berries?! Stunning! So very festive! WAY BACK IN 2007 Before Christmas awhile back, my friends' mother called, asking for help with a recipe. Mrs. K had seen it in a magazine – or wait, maybe a cookbook? she wasn't sure – and was desperate to find it again. 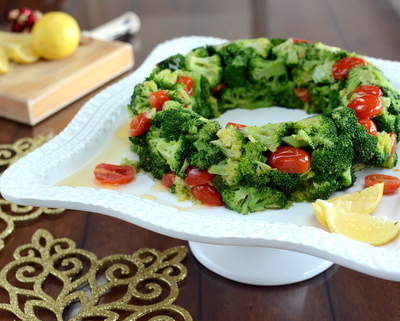 She recalled the basics, broccoli and tomatoes in a wreath shape. But what would bind them? We couldn't think. Not eggs, no, and certainly not gelatin. Cheese maybe? She thought not. So Mrs K returned to her hunt. Many days and magazine piles later, at last she found her recipe. "It's just butter," she exclaimed exultantly. "Do you really think that just butter can hold it all together?" It can! And this festive vegetable dish – buttery yes, but still definitely a vegetable – is absolutely delicious. The ingredient list is short and it's way less fussy than it looks. It does call for a ring mold so check your grandmother's attic for her old "salad form", that's where mine came from, or perhaps the Goodwill or a thrift shop. No luck? I think a round cake pan with a bowl in the center is worth a try, too. Do try to use a shallow cake pan, however, so that it can be inverted onto a plate without upsetting the broccoli. NO RING MOLD? NO ENERGY TO FUSS? STILL LOVE the FESTIVE LOOK? Just cook the broccoli and tomatoes as directed, then put into a shallow casserole dish. Cover and warm through. I think it'll be just fine. Time to table: maybe 60 minutes? FIRST, A LITTLE MISE AN PLACE. Set oven to 350F/180C. Find a ring mold and an oven-safe dish that's as tall as the ring mold and large enough to hold the ring mold with a generous amount of room for water. Locate your serving dish, something that you can lift and then invert with just one hand. I was quite pleased with how the wreath showed off when place on a footed cake stand cake stand! BROCCOLI FLORETS Trim the broccoli, using just the top-most green broccoli tops, cut into small florets. Drop into boiling salted water and return to a boil. Cook until broccoli is cooked but not mushy, it should still be bright green. Taste tiny bits as you go along, if need be, add more salt, the broccoli should be fully seasoned. As soon as it's done, drain the broccoli through a colander, then immerse the colander into the ice water. As soon as it's cool, lift out the colander, leaving behind the water. Magic! Let broccoli drain for a few minutes then arrange in a single layer on a double layer of paper towels. Gently pat the tops with another paper towel. TOMATOES In a large skillet, melt 1/4 cup butter on medium heat until shimmery. Add the tomatoes and warm through but don't allow to pop. Remove from heat, stir in sugar, then season generously with salt and pepper. COMBINE Very gently, stir cooked broccoli florets into the tomatoes. Taste and adjust seasoning. Use a spoon to arrange the broccoli-tomato mixture in the ring mold, taking care, as best possible. to distribute the tomatoes throughout. Once all the broccoli-tomato mixture is in place, press the mixture gently into the mold with the back of a spoon. BAKE Cover the top of the ring mold with foil and place it in the larger pan. (If making ahead, stop here.) Fill the outer pan with boiling water about halfway up the ring mold. Bake for 15 minutes or until heated through. LEMON BUTTER SAUCE While the broccoli cooks, use the skillet used for the tomatoes (no need to wash) to melt the butter. As soon as it's liquid, stir in the lemon juice. Keep warm but don't let the sauce boil. UNMOLD & GARNISH After baking the ring mold, remove it from the larger pan and remove the foil. Place a serving plate on top of the ring mold. With one quick motion, invert the ring mold onto the serving plate, jiggling gently if needed to release the broccoli. Tuck any loose florets back into the wreath. TO SERVE Garnish the serving plate with lemon wedges and extra tomatoes. Drizzle the Lemon Butter Sauce over the broccoli. Serve immediately. BROCCOLI When trimming the two pounds of brocoli crowns, aim to yield a a generous pound of just the very most tender broccoli florets. Even starting with broccoli crowns vs the regular broccoli stalks, it took two+ pounds of broccoli to yield a pound+ of florets. Luckily the stems and stalks make a great broccoli soup. BE GENTLE The butter doesn't "bind" the broccoli as much as lightly contain it. Be gentle. A BED TO CATCH THE JUICES? The broccoli gives off some of the buttery sauce, it pools inelegantly on the side. It might be good to plate the wreath differently (perhaps on a bed of "snow" rice?) so that the buttery sauce has something to soak into. GHEE vs BUTTER If possible, use ghee or clarified butter in the Lemon Butter Sauce, the milk solids look a little goopy poured over the broccoli. SERVING TEMPERATURE The wreath is lovely hot, but because the broccoli pieces are so small, they can't hold the heat long. Luckily, the wreath still tastes good at room temperature so this would work for a buffet, too though of course the wreath effect will be smashed with the first scoop. GOOD MEMORIES Sadly, Mrs K is gone now but her wreath recipe is just one more reason to remember her ever so warmly. Hello Mr K! Hi C&C&E! Hugs J&K! That's so neat! It does look just like a wreath. Very cool! How incredible!! Think it would work with Benecol or maybe Benecol & butter? That is simply too good to pass up. Ah yes, Tanna. (Offline, Tanna told me that Benecol is a cholesterol-lowering margarine.) Benecol is interesting. I also like your idea of using olive oil too, especially in the sauce where it's the lemon juice that shines through. Let me know how it goes! Okay, I am seriously impressed by your wreath! I'm going to root around in the cellar for a ring mold now. Alanna, I got to make this for my next potluck party! Such a pretty presentation! Thanks for the inspiration. So creative - I love it! Looks delicious too...if I celebrated Christmas I would definitely use this idea. I love it! It's brilliant. There should be one of these on every Christmas table! This is such an exciting way to present veggies. Lovely presentation, Alanna. Happy holidays to you and the family. Oh, this is lovely! I'll be doing this for the Family Dinner this year - it's always so nice to have fresh vegetables on the table! Based on the amount of broccoli I ended up buying, I think I will double the recipe, maybe make in a bundt or tube pan. As always, Alanna, thanks for your inspiration!